According to the sticky tag(? 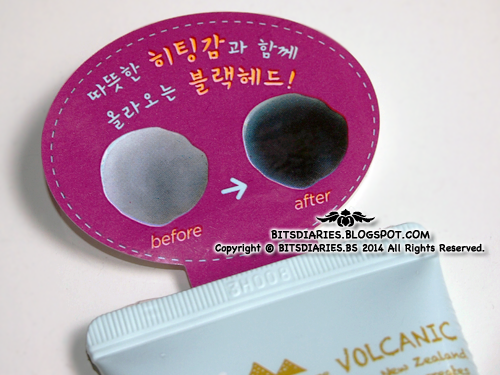 ), this heating gel will change its color from grey to black showing the finishing point of the temperature change. The product is well-sealed with a plastic wrapper. It comes in a squeezable tube bottle with a black twist-off plastic cap and the opening is perfectly sealed with a foil. Upon peeling off the foil, that's how the opening looks like. 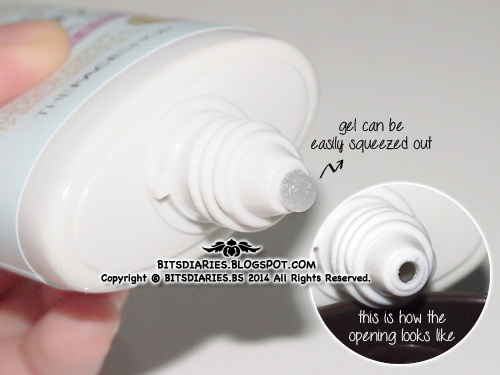 The gel can be easily squeezed out from the tube. It has a sticky gel texture. When you first apply the gel on the skin, you can immediately sense the heat generated from the gel. No worries, the heat is not very hot to the point that will get you scalded or sweat. It's a very gentle warmth. 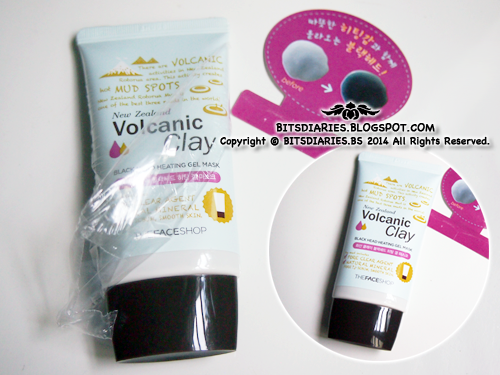 Comparing to "Steam Pore Pack" from Caolion, the level of warmness/hotness of this is consider very, very mild. Upon massaging, it will become slightly watery but not to the extend where it will start dripping. It's pretty much mess-free. 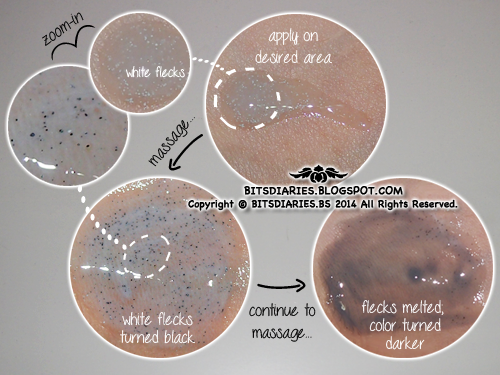 Initially when you squeeze out the gel, it has a light grey color with lots of tiny non-abrasive white flecks. Upon massaging it on the skin, the white flecks will change it's color into black and eventually, the black flecks will melt and change the color of the gel into charcoal grey. 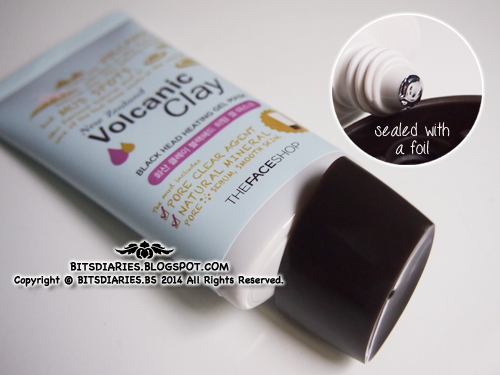 The thicker you apply, the darker the color will get but definitely not as black as shown on the sticky tag. It has a nice floral-like perfume scent but I find it too strong for my liking. I only use this on my nose hence, I couldn't tell if it aids in controlling oil as the oil production on my nose is usually super, SUPER active. I don't think there would be a product that would actually helps to keep the oil production on my nose to stay in control. Verdict: This Heating Gel Mask did heat up like what it claimed and it helped to get rid of some whiteheads and blackheads but take note, not all. It's not very effective in getting rid of those stubborn ones. Maybe I should use this with other products(e.g. a scrub?) to clear the stubborn comedones... hmm... However, after using this mask, it leaves the skin feeling softer and smoother. Also, it does make extraction a lot easier! According to the directions/instructions given, I use this only on my nose. I'm not sure if it can be used on the whole face, though. On the other hand, I think it can be used as a steaming step prior using the nose strip. I had tried it and I realized that the nose strip actually stick out the gunk more easily and effectively. By the way, it steam open the pores but it does not tighten the pores. 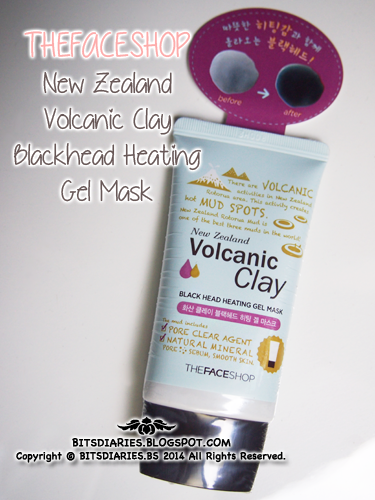 Unlike the Dual Nose Sheet from the same range, that comes in 2 steps — blackhead and tightening sheet or other brands steaming pore products; for example, the brand "Caolion" which they also have steaming pack and on the plus side, they have a tightening pack, the whole New Zealand Volcanic Clay range, apart from the daily skincare products, it doesn't seem to have a tightening mask product. (Correct me if I'm wrong...) I guess that's the downside for this product range. Actually...it doesn't really matter, right? Because you can always look for a tightening product from other brands to solve this problem. FYI, after applying and leaving the heating gel mask on for 15 minutes, I will usually massage it for a minute to loosen the gunk before washing it off with lukewarm water. Next, I will use the nose strip, followed by the "Pore Original Pack" from Caolion to tighten my pores and then my daily skincare routines. Of course, you don't have to follow my steps. All in all, since it did not cause any reactions to my super sensitive skin, I would say this is a pretty mild, non-harsh heating gel mask that works fairly average. Well... definitely not the best heating gel mask, in my opinion.